Who is it for? Stay Quirky Badass Liquid Eyeliner Matte Black is for women looking for a matte, long lasting and a smudge-proof black liner. Apply it along the lash line with the applicator. 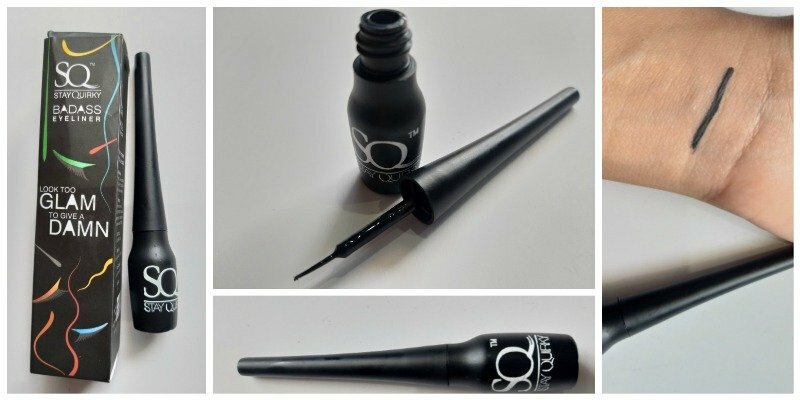 This liner comes in a sleek black bottle with a black applicator. The applicator is has a thin pointed brush that makes it super easy to apply on the eyes. The liner is black in color. It is not too thick nor too thin, it has a perfect consistency. It dries down within seconds leaving a matte finish. You can smell it only when you take your nose really close to the bottle. We girls use a black liner on a regular basis and so it is necessary to have one that is good quality. This liner dries down super quickly when applied, it hardly takes a second. It leaves a matte black finish. It does not smudge and is long lasting. For me, it lasts the whole day long. This liner is waterproof as well. The applicator of this liner is really good and comfortable, it has a thin pointed brush that makes it easy to apply it on the eyes. However the color can be a little darker, it isn’t the darkest black I’ve seen. Otherwise, it’s a really good liner. Long lasting and smudge proof. The color could have a little darker. I would highly recommend this as it is a really good liner. I’m looking forward to trying out new shades of this liner.